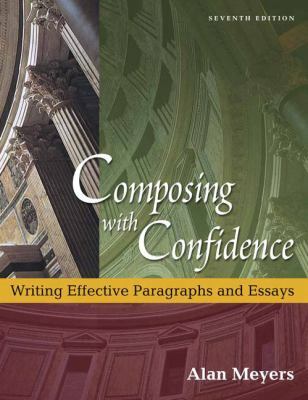 This reader-friendly sixth edition of Composing with Confidence focuses on the writing of paragraphs and essays within the composing process. Readers are guided step by step through the process, but are provided with options in prewriting, discovery, outlining, and predicting. Each chapter in the unit on the rhetorical modes offers academic and professional model paragraphs and essays, along with a well-wrought paragraph assignment, an optional essay writing assignment, and at least five alternative assignments. A new chapter, Writing on the Job, offers instruction in and models of a job application letter, a risumi, and two memos. A repeated feature offers practice in summarizing, paraphrasing, quoting, and arranging material from outside sources. And two new features, Blueprints for Writing and Unit Summaries, offer quick visual summaries of the most important points of the chapter or unit. A full unit on sentence-level issues of grammar and mechanics offers instruction in only those skills that are needed to make writing clear and grammatically correct. Each chapter in the unit ends with two "Editing for Mastery" exercises. "Tips" boxes and "If Your First Language Is Not English" boxes also provide short, specific, and practical advice. The book retains its most popular feature: fast-paced, high-interest, continuous discourse materials that makes it fun to read and work with. For those interested in developing their writing skills at the paragraph to essay level.Meyers, Alan is the author of 'Composing With Confidence ', published 2005 under ISBN 9780321276469 and ISBN 0321276469.